In this Oct. 13, 2016, photo provided by U.S. Marine Corps, two F/A-18D Hornets with Marine All-Weather Fighter Attack Squadron 533 approach a KC-130J with Marine Aerial Refueler Transport Squadron 352 during a Special Purpose Marine Air-Ground Task Force - Crisis Response - Central Command aerial refueling exercise in undisclosed location. On Thursday, Dec. 6, 2018, two American warplanes crashed into the Pacific Ocean off Japan's southwestern coast after a midair collision. The U.S. military has identified five Marines who were declared dead after their refueling plane collided with a fighter jet last week off Japan's southern coast. 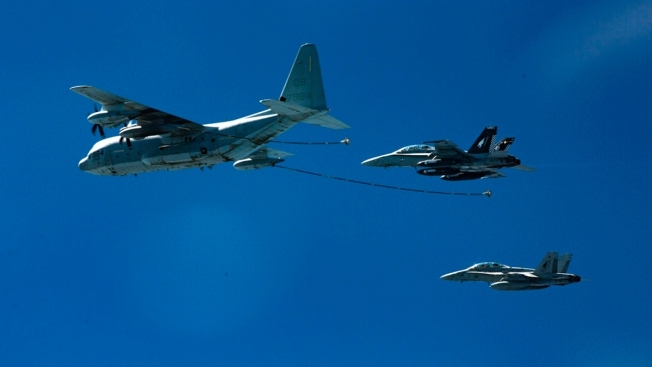 The five crew members identified Wednesday were on a KC-130 Hercules refueling aircraft that collided with an F/A-18 Hornet during regular training. The warplanes crashed into the sea south of Japan's Shikoku island. "It is with heavy hearts that we announce the names of our fallen Marines," Marine Corps Lt. Col. Mitchell T. Maury, the squadron's commanding officer, said in a statement. "They were exceptional aviators, Marines, and friends whom will be eternally missed. Our thoughts and prayers remain with their families and loved ones at this extremely difficult time."